If you ever put a brain through a Picasso filter, you’d probably get something close to a brain ball. When brain balls first hit the neuroscience scene in 2013, they were just a curious oddity. Each smaller than a grain of sand, brain balls are conglomerates of neurons seemingly haphazardly mushed into misshapen blobs. But there’s a serious twist: they’re utterly, completely, absolutely alive. Yup, that’s right: scientists are making living blobs of brain-like organs floating in a dish. Rather than just the stuff of nightmares, these little guys soon proved their worth. When grown inside a host mouse (creepy! ), brain balls—or as the academic community calls them, cerebral organoids—organize into 3D structures remarkably similar to the developing brain. They sparkle with electrical activity. They develop retinal cells—the critical component of eyes (creepier!). They’re a cellular bonanza of neurons and non-neural cells called glia. By eight months old, they contain roughly the same density of synapses as a human fetal cortex. While few are willing to argue that brain balls “think” or “see,” they’re definitely doing something. Add the fact that they’re made up of human cells—rather than animal ones—and many neuroscientists believe they’re our best bet for studying neurodevelopmental disorders like autism or schizophrenia. They’ve already proven their worth for finding drugs that protect the Zika-infected fetal brain. Some even think they’re the key to cracking glioblastoma, the deadliest type of brain cancer. There’s just one major problem: brain balls have no heart. Because they lack their own blood supply, brain balls have no way to actively shuttle oxygen and nutrients to their dense inner core. Without vessels, these neurons drown in their own metabolic waste and gradually wither and die. Take away blood, and there’s no way for brain balls to mature past the equivalent of a fetal second trimester. Now, for the first time, a team from UC Davis managed to insert a homegrown blood vessel network into maturing brain balls. The trick was to embed baby brain balls into a nutritional gel together with endothelial cells—the cells that line blood vessels. When transplanted into a mouse, the brain organoids sprouted extensive vasculature similar to the shape of multi-layered petals in rose buds. These vessels reached far and wide throughout the brain blob, penetrating deep into the core. The team published their results in this month’s NeuroReport. “Vascularization…is considered a crucial next step in the bioengineering of complex human brain tissue,” the authors wrote. A blood supply gives them the chance to mature further into the complex computational organ found in our heads. “It’s a big deal,” said Dr. Christof Koch, president of the Allen Institute for Brain Science who was not involved in the work. 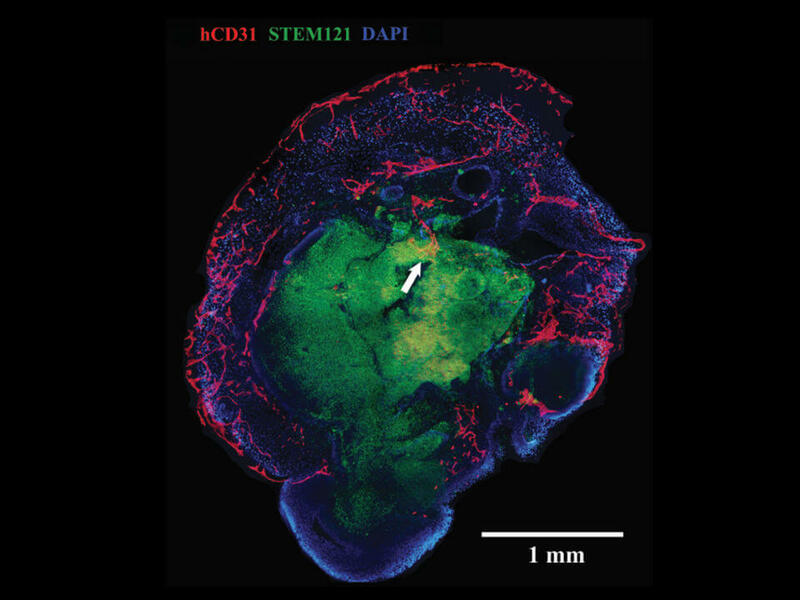 Because the point of organoids is to recapitulate a patient’s brain injuries inside the lab, the closer they are to the real thing, the more valuable they become. The team tweaked a well-known recipe for making brain balls. They got their idea from studying the developing brain. The brain itself doesn’t have cells that directly mature into blood vessels, they explained. That means the vessels have to come from outside the brain—so if we put a proto-brain together with blood vessel cells, that might work. Someone’s already tested the trick in mice, though—up until now—no one’s attempted it with human organoids. Taking a small sample of a patient’s skin, the team transformed the cells into induced pluripotent stem cells (iPSCs). Similar to naturally-occurring stem cells, iPSCs have the vast ability to convert into almost any type of mature cells in the body. The team painstakingly grew the patient’s iPSCs for five weeks inside a nutritious chemical cocktail designed to push them into baby brain organoids. They then isolated each organoid and gently embedded it into a soft gel. At the same time, the team saved a small portion of iPSCs and transformed them into endothelial cells—cells that line the inside of blood vessels. They laid roughly 250,000 of these guys into the gel, so that they pillowed the nascent brain organoids. After cohabiting for three to five weeks, the team then stuck the vascular brain balls into the ultimate incubator: a living rodent’s brain, from which they had carefully removed a small chunk to make room for their brain organoid. Naked brain balls grown without blood vessel cells were also transplanted as a control. Two weeks later, the naked organoids died off, whereas the ones grown with blood vessels thrived. When the team studied their bizarre organoids under the microscope, they found massive networks of blood vessels and capillaries blooming throughout the mini-brain, even at the normally dead center core. Waldau isn’t the first to tackle the blood vessel problem. Last year, at the Society for Neuroscience annual meeting, scientists from the Salk Institute and the University of Pennsylvania both reported vascularized mini-brains. When transplanted into rodent brains, the rodents’ own vessels tunneled inside the human brain transplants to bathe them in nutrient-rich blood. That’s definitely one way towards more complex brain organoids. But many in the field are iffy about potential consequences. The transplanted organoids reached out extensive neuronal branches into the rodent brain, and formed functional synapses with their host. When stimulated, those synapses lit up like fireworks. Brain organoids are reaching a tipping point, one that bioethicists and scientists aren’t ready to deal with. Waldau’s self-vascularized brain balls offer a way out. If brain balls can grow their own blood vessels, scientists could potentially take rodent hosts (at least partially) out of the picture. One potential way is to hook them up to microfluidic pumps: a brain inside a vat, while often a sci-fi trope, is far less skin-crawling than a rodent with human brain blobs. Scientists can use these so-called “ex vivo” mini-brains to screen for neurological drugs. These vascularized blobs are especially useful for conditions like stroke, Alzheimer’s, and brain injury, because they often cause the brain’s vasculature to reorganize. Talk about expanding mini-brains in an entirely new—cough—vein.